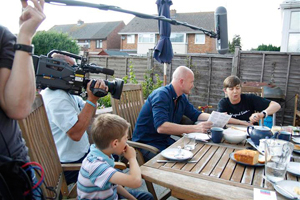 As shown on “Drinking Our Rivers Dry?” on BBC Panorama the McRobie family reduced their water consumption by almost 50%, from 443 litres to 227 litres a day. What the programme didn’t show was how they did it… In fact, none of the talking heads on the programme actually mentioned the important role that behaviour change can have on reducing water stress in the UK and yet it is free, empowers the individual, and crucially reduces CO2 emissions produced when heating domestic water as most savings from behaviour change result in shorter showers or shallower baths. There is a target to reduce water consumption from an average of 150 litres per person per day to 130 litres, a reduction of 20 litres per person. As the programme showed, even families that use at or near the UK average can still make easy savings, purely by changing behaviour. To save water successfully you need to understand how much you use and where, analyse where the easiest savings can be made, and then put that knowledge into practice! Over the week that we logged the family’s water use, the above behaviour resulted in an average use of 443 litres per day for the whole family and a wide range of 260 to 600 litres per day. The challenge was to see by how much they could reduce this. Reduced how full we ran the bath – we used the same 4 minutes timer for the shower, but this time used it to time how long the taps were on for – in 4 minutes our bath filled to approx 10cm. Washed pans up by hand, thus creating more space in the dishwasher for other items. Used the dual flush toilets correctly. Shower: The biggest savings came from reducing the time they are in the shower and for the kids, how much water they use in the bath. The family has two showers. The one they use most is a walk in shower which has a large shower head. Luckily it is flow regulated and the flow is only 8 litres/minute. However ten minutes at 8 litres a minute is 80 litres a day; over half the UK average water consumption used every morning in the shower. By reducing their shower time down from ten minutes to four minutes Marie and Jamie each save 48 litres of water a day. Bath: I love the idea that the children have cut their bath use down to four minutes as well in so far as they fill the bath up for four minutes using the timer. Jamie says it fills to about 10 cm deep. That’s probably about 60 – 80 litres of water in the bath, which is a saving of between 80 – 100 litres per bath. Toilet: The family has a 6/4 litre dual flush toilet. If the family use their toilet at the UK average rate of 5 times a day at home, by ensuring they always use the short flush when they have just had a wee, the family will save 32 litres of water per day. Dishwasher: Most people who have a dishwasher don’t use it as efficiently as they could. The family’s dishwasher uses 14 litres of water each time they use it. They halved their dishwasher use. Can they keep the savings up? I think it may prove difficult as the kids get older and start to want to spend hours in the shower, but I certainly think they will continue to use less than 130 litres per person per day. Top tips for saving water!